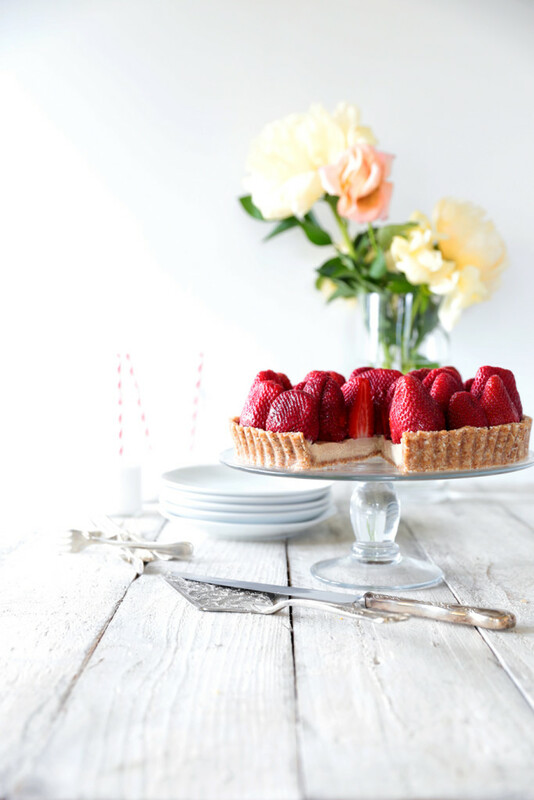 This raw strawberry tart was inspired by some amazingly large, ripe, juicy strawberries that were leftover from a birthday party. These particular strawberries were the super delicious sweet kind and were exactly what you’d imagine the perfect strawberry to look and taste like. When I think of strawberries I naturally think of cream, or in the case of a tart, a vanilla custard cream. I decided to go one better and make this tart with a white chocolate custard cream. And by cream I really mean cashew cream as this is a gluten, dairy, egg & refined sugar free tart of goodness! So for nostalgia sake, I have loosely based this raw strawberry tart recipe on those traditional fruit flan flavours. The base is reminiscent of a vanilla biscuit base and is made from almonds, brazils, cashews, coconut and dates. This is super easy to prepare as you literally blend it all in a food processor and then press it into your flan tin. I used a large 26cm flan tin but this recipe would work equally well with a standard springform tin or individual flan tins. The white chocolate custard cream is made from soaked cashew nuts (I have added some notes on soaking below) as they create a lovely creamy base. These are then combined with raw cacao butter which brings the white chocolate element, vanilla for flavour, pure maple syrup to sweeten, coconut oil for setting, and coconut milk for consistency. After you have soaked the cashews it’s simply as case of blending all the ingredients in a high speed blender and then pouring the white chocolate cream into your tart case to set. When the custard layer is set the tart is ready to for the strawberries. I kept this part really simple and literally just stood the strawberries on top of the custard, arranging them so there were as few gaps as possible. Equally you could slice the strawberries in half and arrange them lying down or you could cut them into slices and arrange them in spikes to create a more art deco style flan. 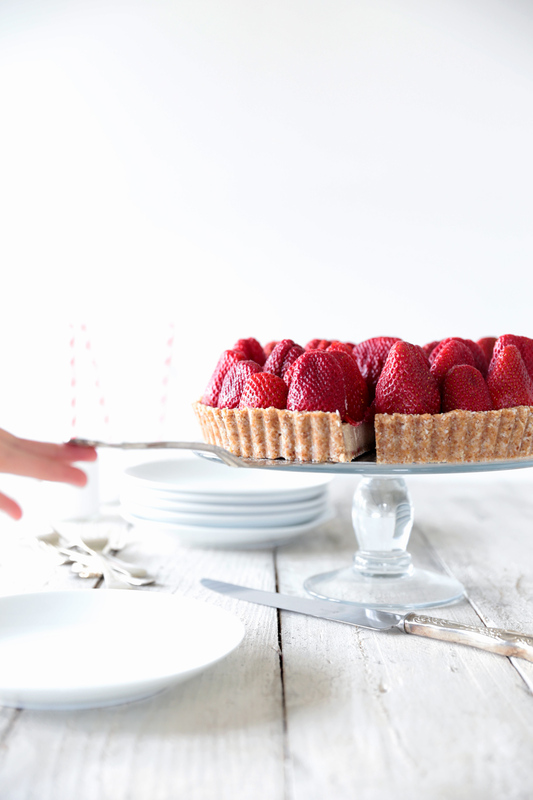 The way you choose to decorate the tart is entirely up to you. And if you’d prefer to use another type of fruit entirely, by all means do. Raspberries, blueberries or blackberries would all be amazing and if you wanted to get really creative you could make a mixed fruit flan using whatever fruit you like. This raw strawberry tart will keep sealed in the fridge for up to 5 days, although it is best eaten fresh on the day it is made. I think it would make a fabulous celebration dessert, and would be perfect for Christmas day. Hope you give this recipe a try and if you post any photos to Instagram be sure to tag @swoon.food #swoonfood so I can come and admire them! Any questions about this recipe? Do you have a favourite strawberry recipe? Leave your comments in the section below, I would love to hear from you! Start by soaking the cashew nuts. Place 2 cups of raw cashew nuts in a bowl, cover with filtered water and leave to stand for 2-4 hours. Drain off the water and rinse the cashews well. To make the base, gently melt the coconut oil by placing it in a heatproof bowl over a pan of steaming water with the heat turned off (see notes below). Place the coconut, almonds, brazil nuts and salt into a food processor and blend until the mixture looks like chunky crumbs. Add the medjool dates (ensuring you have removed the pitts!) and blend until they are well combined. Lastly add the melted coconut oil while the motor is running. Lightly grease the bottom of your flan tin with a wipe of coconut oil. Press the base mixture evenly into the tin and up the sides, then place in the fridge to set. To make the white chocolate custard cream first gently melt your coconut oil and cacao butter using the method as above. Place the soaked and drained cashews into a high speed blender (e.g. Vitamix/Blendtec) along with the coconut milk, pure maple syrup, vanilla and sea salt, and blend until smooth. You may need to use your blender stirring stick to ensure it’s evenly blended. When the mixture is smooth, add the melted cacao butter gradually through the top of the blender while the motor is running, followed by the coconut oil. These should blend in completely and you should end up with a smooth thick cream. Pour the white chocolate cream into the tart base, smooth with a spatula and place in the freezer to set for approximately 30minutes to an hour depending on your freezer. You can also place the tart in the fridge to set, but it will take much longer. Once the white chocolate cream is set, remove the tart from the freezer and pop it out of the tart tin onto a serving plate. Prepare the strawberries by washing thoroughly, removing the greens and patting dry. 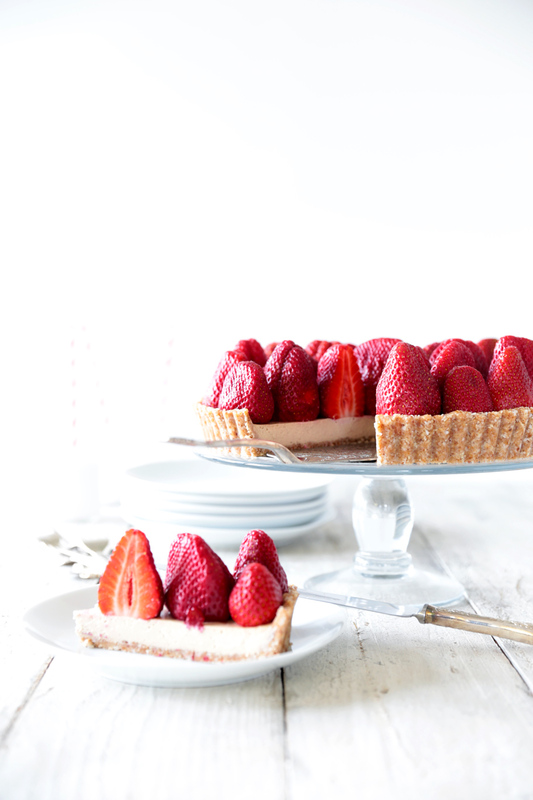 Arrange the strawberries on top of the tart with as few gaps as possible. 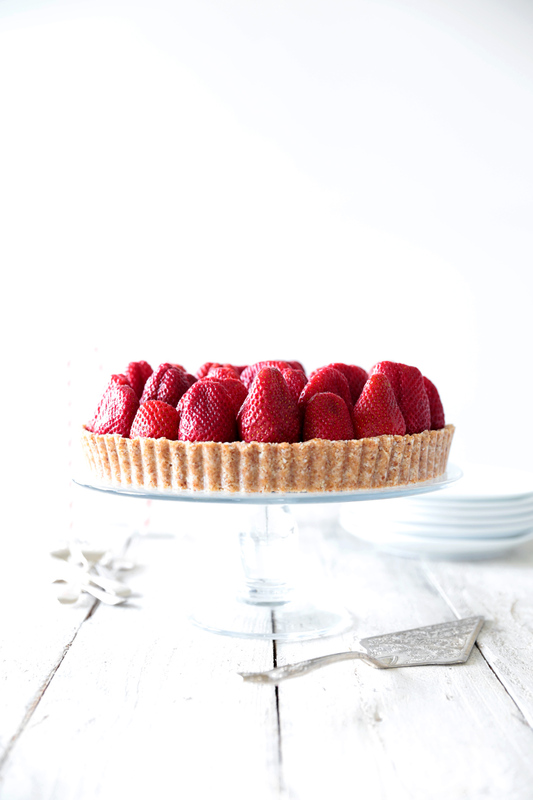 Return the finished tart to the fridge until ready to serve. This raw strawberry start will keep covered in the fridge for up to 5 days. Note on activating nuts: activating is the process of soaking nuts (or seeds) in water to remove the natural inhibitor enzymes on their skins to make them more digestible. The cashews in the cheesecake filling of this recipe are therefore activated. If you also wanted to activate the cashews and almonds in the base for this recipe they would need to be soaked and then dried. Ideally this would be in a dehydrator at 41ºC for 1 1/2 – 2 days, or in an oven on the lowest fan bake setting with the door ajar for about a day. The aim is to keep the nuts below 41ºC so the nutrients remain unaffected by heat and the food still deemed raw. Note on melting raw ingredients: to ensure ingredients remain in their raw form and their nutrients fully intact, they must not be heated above 41º. When melting raw coconut oil or raw cacao butter, do so by placing the bowl of ingredients over a pot of steaming water with the heat turned off. This should ensure the ingredients do not heat above 41ºC. Note on choosing coconut oil: it is important which type of coconut oil you choose. A lot of the cheaper coconut oils are heat or chemical processed which destroys the inherent nutrients that have made coconut oil so popular recently. Look for ‘cold pressed, extra virgin, organic’ or ‘unrefined raw’ coconut oil. Even though it may cost a little more, it is WAY better for you. Coconut oil contains high quantities of lauric acid which has anti-bacterial, anti-fungal, anti-viral and anti-inflammatory properties. It boosts your immune system and metabolism, lowers blood pressure and helps with the absorption of minerals. Even though coconut oil is a saturated fat, it is considered a ‘heathier’ fat because lauric acid is a medium chain fatty acid. This means it is easily digestible and processed by your body in the same way as carbohydrates as a direct source of energy. Note on choosing maple syrup: make sure you get the real deal! There are quite a few maple syrups out there that are just maple flavoured sugar syrup, full of additives and often high fructose corn syrup. Pure maple syrup lists only “pure maple syrup” under ingredients and is made by a natural process of extracting the sap from maple trees, evaporating off excess water and filtering to remove impurities. Pure maple syrup is an unrefined sugar and has a lower glycemic index than refined sugar. It contains minerals and antioxidants such as calcium, potassium, iron, manganese and zinc, unlike refined sugar which contains none. 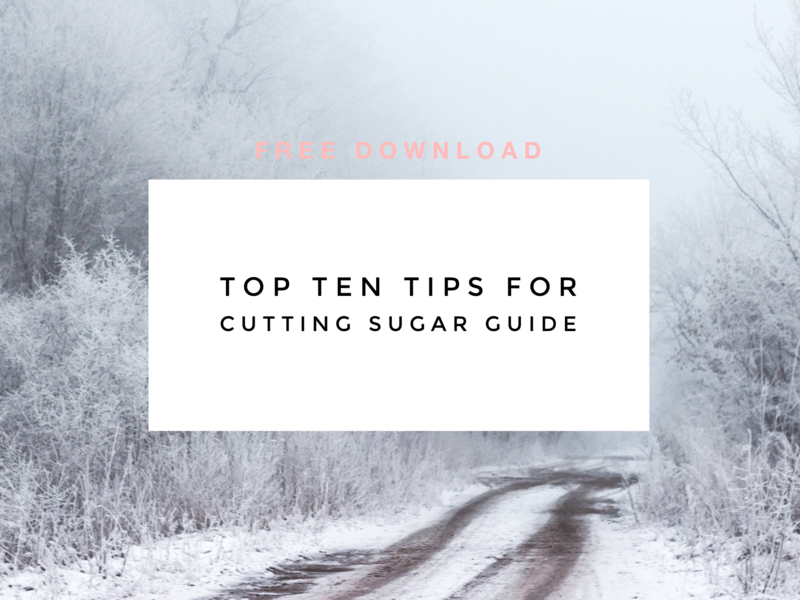 Maple syrup is still a form of sugar however, so while it is better choice than refined sugar it is still best used in moderation. Feel free to use less in this recipe if it suits your tastes and if you do decrease the amount of maple syrup, replace the quantity you leave out with an equal amount of coconut milk. This was a dream to make! So simple but looked and tasted amazing. Hi Lucy, so pleased you enjoyed this recipe 🙂 Merry Christmas! I know that you have posted this recipe very long ago, but I have a (I think important) question because I would like to recreate this tart on my birthady and I don’t want to spoil it :’) Do you use canned coconut milk? If No, can I use another plant milk instead?